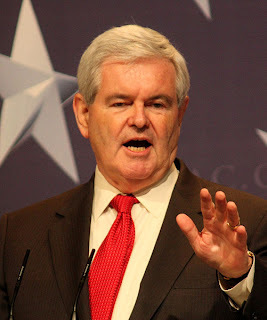 Republican presidential candidate Newt Gingrich used the term “green conservatism” to describe his 2007 book A Contract With the Earth at a May 27, 2011 house party in Manchester, NH. On Tuesday, the term popped up again during Gingrich's interview with conservative talk show host Glenn Beck. Beck played an audio clip from the 2007 debate on climate change that pitted the former House Speaker against John Kerry, the Democratic Senator from Massachusetts. “I think there has to be a, if you will, a green conservatism,” Gingrich said at the time. This gem of a quote was dug up a few days before by Factcheck.org, which recently ran an excellent piece examining Newt’s rather complicated record on climate change. Glenn Beck: Help me out. This is a multiyear stance. It’s not a moment in your life. Glenn Beck: So do I.
Newt Gingrich: Okay. Second, I think that there is evidence on both sides of the climate change argument, and the point I was making was in a situation where, for example, having a larger nuclear program reduces carbon in the atmosphere, it’s a prudent thing to look at nuclear as one of the actions. Glenn Beck: Do you ‑‑ do you still believe in the, you know, the Inconvenient Truth as outlined by global climate change advocates? Newt Gingrich: Well, I never believed in Al Gore’s fantasies and, in fact, if you look at the record, the day that Al Gore testified at the Energy and Commerce Committee in favor of cap and trade, I was the next witness and I testified against cap and trade. And in the Senate, I worked through American solutions to help beat the cap and trade bill. Cap and trade was an effort by the left to use the environment as an excuse to get total control over the American economy, centralizing a Washington bureaucracy. In the end it had nothing to do with the environment. It had everything to do with their desire to control our lives. As a presidential candidate, Newt Gingrich has generally shied away from using terms like “green coal”. His 21st Century Contract with America calls for expanded development of coal, but says nothing about it being clean.